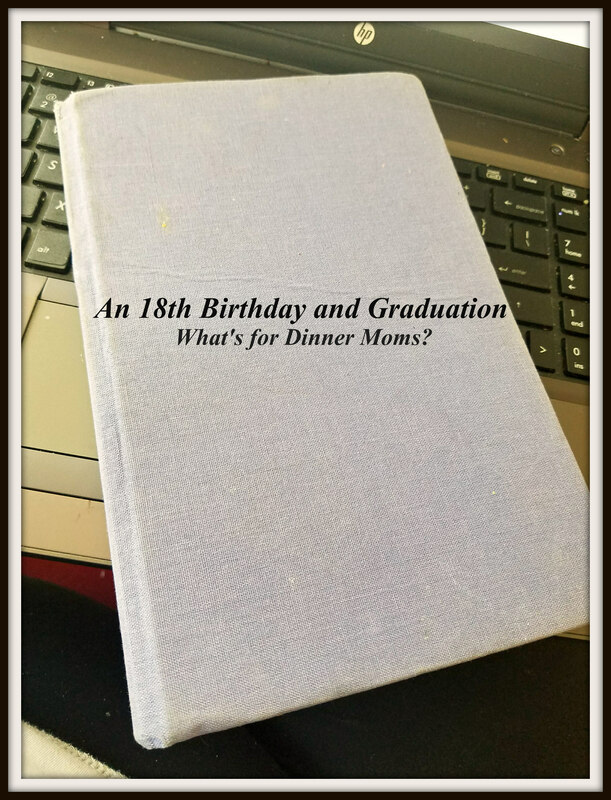 An 18th Birthday and Graduation – What's for Dinner Moms? For her 18th birthday and graduation gift from me my daughter gets this old purple book. It doesn’t look like much and most people would think I was crazy. In 2002 I started a journal for my daughter. She was about 18 months old and I decided I needed to write down the little every day moments we tend to forget over time. Not the big momentous times but the little every day things that get lost in our memories. The first entry was a letter to her for her 18th birthday and graduation explaining why I was writing her the journal and if for any reason I couldn’t be with her that I had all kinds of visions of the kind of person she may be and what I hoped I could teach her along the way. Truth be told, I never pictured myself growing old. Since I was young I always thought I would die younger. I don’t know why it is just a belief I had. So, I wanted to be sure that no matter what that my daughter knew that I dearly loved her and how proud and happy I was to be her mom. I just finished writing the last entry to her. I wanted to share a bit of it with all of you. This will be the last entry I write. I love you and though I know I was not the perfect mother I hope you know I always tried to do what was best for you. It is the last day of your childhood. I hope you are able to look back over time and have joyous happy memories to share. I hope that you can see the times of great learning, great joy, and great love for there were many. You brought tears to my eyes with this. Such a heartfelt gift. It’s one I hope your daughter treasures for always. What a wonderful thing to have done, Marci. I am sure your daughter will treasure this amazing gift. I cried. You are the coolest mom. Thank you. Now my kids may disagree. Haha. Thank you. I figure one day when she has children she will understand it more. Again, your book idea touched me deeply. Thank you, Erika. I have a horrible memory and realized I was struggling to remember all the little day to day joys I had as a mom and wanted to remember them. The book was the only way I could think of and then it became when she is 18…. And now this is a collection of memories for both of you. Beautiful! Shoulda warned me I’d need tissue! Oh, it’s beautiful, and I’m she’ll treasure it, and more so as she matures. To your Girlie, Happy Birthday, and Congratulations for making it through High School! Many wonderful adventures await you!! You are so patient and enduring to keep it up for so long. Bravo and congratulations to Catherine. Awww… what a sweet and beautiful gift. Your daughter will always have this book to treasure now. I am such a sucker for sentimental things, worth more than gold to me. Oh my gosh you’ve made this crazy pregnant lady here bawl! So beautiful. Sorry I made you cry but thank you! What a wonderfully, thoughtful gift! You are welcome! I love your idea!